Jon is a well-known street / mural / tattoo artist from Los Angeles. 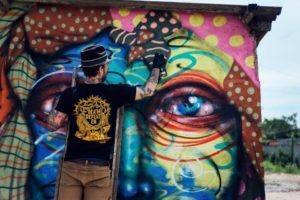 Driven by his artistic talent and inspired by his faith, Jon has created a movement, “In Name And Blood”, that raises money for the less fortunate and invites others to join in and help give back to those in need. 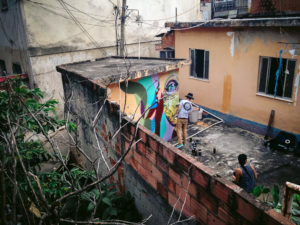 "I like to use art to beautify the community as well as sharing Jesus with others. Sometimes I just paint girls and sometimes I put up screen prints with Jesus on them, I also sell shirts and posters to raise money to give people on skid row toothbrushes toothpaste, soap and sometimes a lunch." 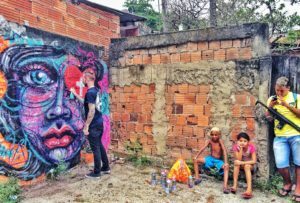 Jon's long term goal would be to travel to other countries and paint the homes of people in 3rd world countries making their small make-shift homes beautiful and bringing supplies to them as well as hanging with the kids and showing them how to paint. 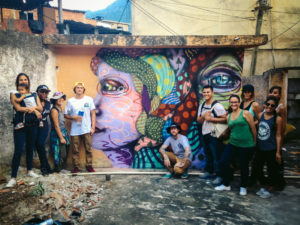 In 2014 Jon joined Passport 2 Freedom on our first Mission Trip to the Favela - doing exactly this! You can find Jon's art mostly in LA around the Melrose area or in the Arts district. 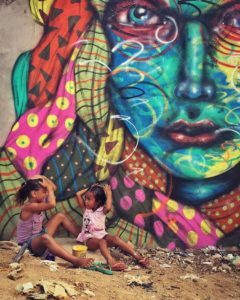 And his work can be found in New York around the Brooklyn area like Williamsburg and Green Point. "Passport 2 Freedom feels super excited to have Jon as a supporter and as a part of our crew."